This scrutiny is critical, because the normal state of the Lake Erie tributaries is low and clear (due to poor ground water flow) and they are highly dependent on run-off from precipitation to get them up to higher flows. Even the damned flows of the Grand River in OH and the Cattaraugus in NY don’t provide much of a minimal base flow. When the tributaries do approach (or reach) peak run-off levels (the result of a substantial rain fall and/or snow-melt episode) most become a muddy torrent with few fishing opportunities. As stream levels drop, the water clarity improves, eventually reaching the coveted “prime” conditions sought after by steelheaders. “Prime” run-off flows on the Lake Erie tributaries have characteristic green-tinted water coloration (due to suspended clay particles eroded from shale streambeds). In this type of water clarity steelhead are easier to catch because their visibility is limited. They can see your fly offering, but not too clearly. This ambiguity in their vision makes them very cooperative fly takers. These ideal conditions can be short lived and vary in length from only several hours, a few days or as much as a week or more depending on the amount of run-off received, ongoing weather patterns, water table levels (current ground saturation) and the run-off characteristics of that particular tributary watershed. Higher tributary flows translate into more fishable water to properly perform both indicating and swinging presentations. It also means steelhead can locate into a greater number of resting and holding locations during their upstream migration movements. 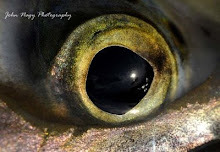 This gives steelheaders more fishing opportunities (unlike low and clear conditions which can concentrate both steelhead and fisherman into “fish bowl” conditions). Run-off also initiates fresh runs of steelhead into the tributaries from Lake Erie, “energizes” older fish already in the stream which have experienced daily fishing pressure (and the stress of low water flows) and helps the movement of steelhead upstream toward spawning gravel. Since the watershed size of the Lake Erie tributaries vary greatly, each tributary will run off to prime conditions depending on its size. Knowing the “run-off rates” of the Lake Erie tributaries is very important in predicting how fast a specific tributary will run-off to prime conditions after receiving precipitation from rainfall and/or snow-melt. The run-off rates of all the major Lake Erie tributaries are summarized in John Nagy’s Steelhead Guide book. The steelheadsite.com (under OH reports section/OH tribs ideal flow project) also has ideal flow charts. -Internet real time USGS tributary flow data (http://water.usgs.gov/realtime.html) graphs 24/7 water flow of many Lake Erie tributaries (in discharge/cfs and height/feet). Non-gaged tributaries can be monitored if you know by experience how they run-off in relation to a gaged river. Some gages include temperature and turbidity measurements. 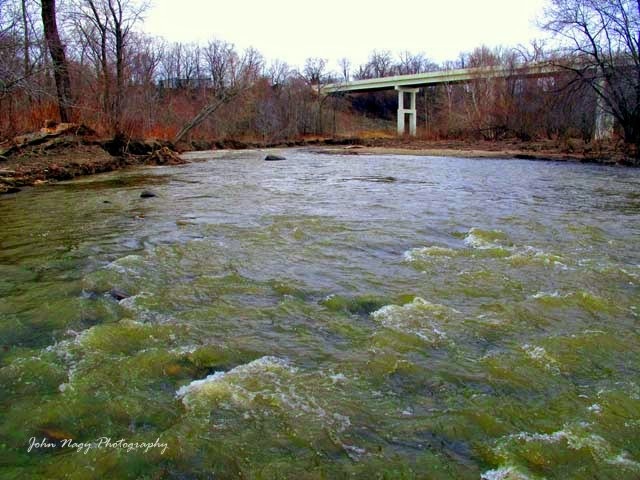 Remember that most tributaries will begin to clear in their upper reaches but some like the large Grand River in OH typically clear at the bottom first (due to its long length). The Cattaraugus Creek in NY can still flow turbid even at fishable levels. -Short and long range weather forecasts by the National Weather Service (http://www.erh.noaa.gov/). -Local 24 hour precipitation amounts by the National Weather Service to more precisely determine the location and amount of precipitation that has fallen. The characteristics of a weather system (speed, location, intensity) moving through can affect specific tributary watersheds differently versus other areas of steelhead alley. -Local tackle shops (reliable reports are from shop owner or employees who actually visited a tributary or tributaries that day). -Local steelheader's (probably the best report since they are most intimate with the local steelhead tribs and can give up to the minute and projected water conditions. -On location webcams which give a real-time visual of some tributaries (for Elk Creek visit http://www.unclejohnselkcreekcamp.com/webcam/). -For lakeshore steelheaders (fishing at or near a tributary mouth) a Lake Erie live webcam (http://www.greatlakesvista.com/ or www.lakevision.com) and a National Weather Forecast near shore marine forecast (which includes near shore lake temperatures). Real-time and forecasted lake conditions can be very helpful for determining best surf fishing fishing conditions (occurs when the lake “flattens out” with a southerly wind) and to monitor steelhead near shore staging movements (a 68 degrees F shoreline temperature initiates staging steelhead near tributary mouths in late summer/early fall). Snow or ice melting very quickly due to rain and/or rapidly increasing air temperatures (occurring both during the day and night) can cause tremendous run-off especially if heavy snow pack and ice accumulations exist. This obviously spikes the river gages to extreme levels and prolongs the run-off rates. Ideally you want a slow melt of snow and ice during the winter months with moderating air temperatures during the day (30’s and 40’s) to allow for a slow melt and sub-freezing temperatures at night to keep the run-off in check. This type of melt run-off typically runs clear to moderately stained as well as ice cold, keeping the tributaries fishable for extended periods of time. Being on a tributary during prime conditions does not guarantee steelhead heaven though. A number of scenarios can play havoc with your day on the water including early fall run-off which can be very silty even at ideal levels due to summer silt accumulation, fall leaf-drop which can clog the stream with leaves hindering drifts and obscuring your fly, morning slush and ice flows which can make getting your fly on the bottom a challenge, spring smolt stockings and sucker runs which can make it impossible to hook a steelhead in some areas and unexpected run-off from bridge or road construction that is often a muddy mess ruining downstream fishing. Note: Great Lakes steelheader's fishing outside the steelhead alley region often encounter power generating, damned tributaries with controlled flow releases (such as the Lake Ontario’s Oak Orchard and Salmon Rivers in NY). Flow releases can vary daily, affecting both the wading and fishing conditions. Major run-off events can have minimal effect (in the short term) on these rivers due to the “buffering” effect of large impoundments above the dams. Steelheader's are advised to monitor power company dam release flows on the internet to target the best fishing conditions for flow, as well as for safe wading. These rivers also are usually very fishable during the winter months due to the power generating dam releases which are warm enough to prevent freeze-over. Also, in regards to winter steelhead fishing, often the toughest aspect of winter steelheading is actually getting to (and traveling back) from the steelhead alley tributaries. Local steelheader's definitely have an advantage here. Anyone considering steelhead fishing this time of the year (and traveling at a distance) should carefully monitor the weather for lake effect snow and ice conditions as they impact the interstates and state routes. No steelhead is worth being stranded on the highway or getting into an accident for. Look for “windows” in the weather for traveling to and from the tribs. If bad weather hits (after a day of fishing) seriously consider spending the night at a local motel to avoid any problems. 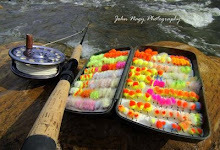 More detailed information on fly fishing for Great Lakes Steelhead can be found in John Nagy's classic book "Steelhead Guide, Fly Fishing Techniques and Strategies for Lake Erie Steelhead." 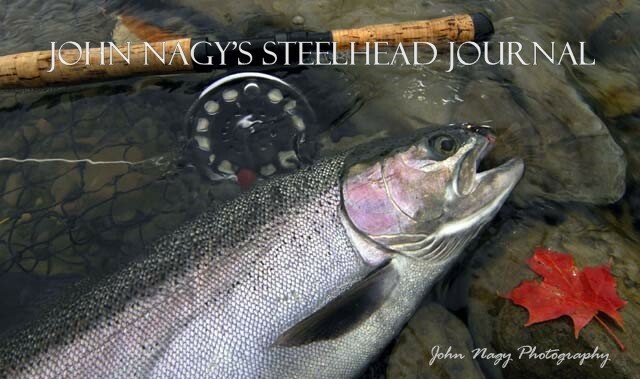 John Nagy's "Steelheader's Journal" makes a great companion book to the Steelhead Guide. Please go to the sidebar for ordering information for these books.